Steven Callahan is a widely respected writer and editor with hundreds of articles to his credit for publications in the U.S. and abroad. He is currently serving as Editor at Large for Cruising World magazine. Callahan's already strong interest in safety at sea and survival was further focused after surviving for 76 days alone in a life raft in 1982, chronicled in his award winning bestseller, "Adrift, 76 Days Lost at Sea," one of the best survival tales ever written. A naval architect by training, he is president of S.P. Callahan & Associates, providing design, research and consulting services to the boat building and marine safety industries. Callahan also authored "Capsized," the true story of four men who survived 119 days adrift in a capsized multi-hull sailboat. He has contributed to seven other books on seamanship, safety and survival, including serving as contributing editor and illustrator of "Survivor" by Michael Greenwald, the "bible" of sea survival. He is a regular lecturer on the subject of seamanship, safety and survival at maritime events around the world. On his own boats and as a delivery skipper he has amassed over 70,000 offshore miles including seven ocean crossings (four double-handed and one single-handed), and fifteen passages (three single-handed) between the U.S. and Bermuda. 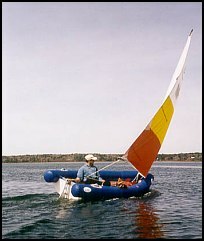 Callahan is also the inventor and developer of "The Clam," a unique folding RIB that is specifically designed to be equipped as a survival craft (that's him sailing The Clam prototype in the photo). The first model of this patented design was an 11.5 foot unsinkable sailing/rowing dinghy that stores as a 22 inch x 5 x 4 foot package. Unfortunately, production ceased after licensee HydraNova built 16 boats. © 2001 - 2011 Douglas S. Ritter & Equipped To Survive Foundation, Inc.